In the late 90's, I could most days be found in a t-shirt dress. Though I'm no longer a teenager, I still love this style and yet have hardly seen it in recent years. A t-shirt dress can be so versatile. You can layer it with scarves, jackets, cardigans, tights... It can provide the perfect basic backdrop for a statement necklace. Shoe options are endless from stilettos to more sporty styles and even flip flops when on holiday or poolside. 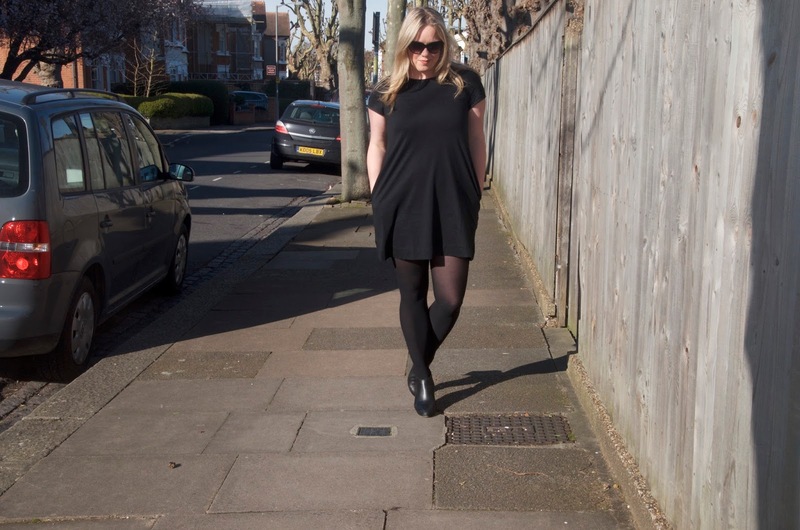 I've had this simple black Gap A-line Tee Dress for only about a week and I've already worn it twice... It's becoming a staple in my wardrobe and I'm not ashamed to admit I bought it in multiple colors! I love the long hem, the fabric is lovely and doesn't wrinkle easily and the A-line shape is flattering with a little 1960's vibe to it. I can already tell this will be my go-to dress for Spring. What basic wardrobe staples are you stocking up on for Spring and Summer?